Flappy Bird was a veritable phenomenon. It seems ridiculous in hindsight (and, let’s be honest, it kind of did at the time, too), but the exceedingly simplistic title had a momentary stranglehold on the mobile gaming world with its combination of crude 8-bit graphics and dead simple game play, as players tapped the screen frantically to avoid crashing into pipes. The games aesthetic was clearly borrowed from Mario, and now that everyone’s plucky plumber has finally officially come to mobile gaming, it’s easy to see how Nintendo’s one-handed, constantly moving side scroller might have take its own inspiration from the title. Creator Dong Nguyen ultimately backed away from the spotlight in the wake of the game’s success. This week, however, he’s returned with Ninja Spinki, a new mobile title that builds upon Flappy Bird’s most popular elements for something a bit more complex, though ultimately equally frustrating. The title stars a bug-eyed and Micky Mouse-eared ninja tasked with avoid things like bounding fruit and giant cat heads (which evoke Fruit Ninja and Neko Atsume, respectively) – two of the ninja’s best known mortal enemies. 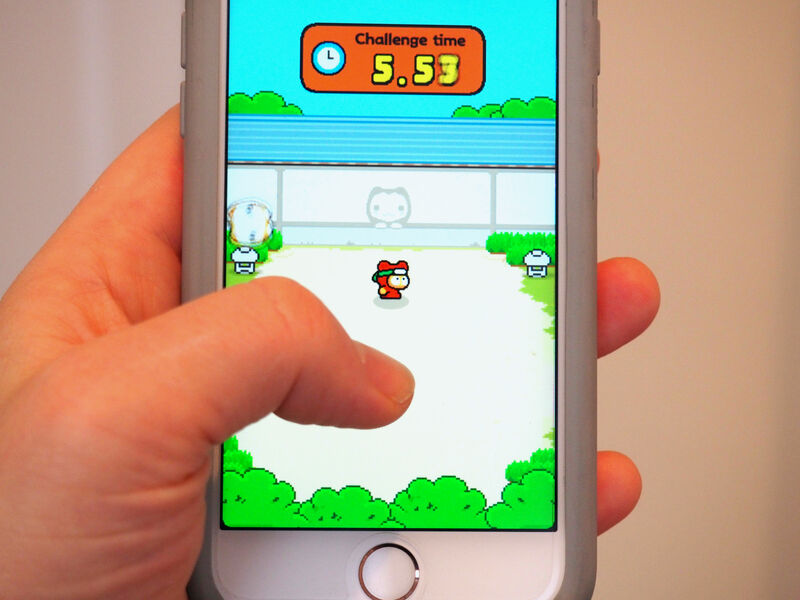 There are six different mini-games with different mechanics and opponents, but the constant tapping and swiping should prove comfortably familiar to Flappy Bird die-hards. And like that game, things start off simply enough, but ultimately trend toward the impossible. Two modes let the user pick between levels or endless game play. I’d recommend the former, since it at least offers some sense of accomplishment before meeting your untimely demise. There are five levels in each game, which unlock once you’ve managed to avoid all obstacles by the time the clock counts down. Like Flappy Bird, the game is free to play, though it’s ad-supported, so you’ll end up sitting through some frustrating 30 videos after every few rounds. But, then, frustration is kind of the name of the game.